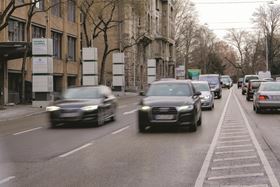 Mann+Hummel has extended its Filter Cubes technology to reduce NO2 pollution. Mann+Hummel has introduced new technology which reduces nitrogen dioxide (NO2) at locations with high levels of pollution. The company has extended its Filter Cubes technology to integrate a newly developed combifilter medium. It includes a filter layer that retains particles and additional activated carbon layers to adsorb NO2. This process uses highly porous activated carbon media which, due to the large surface area, can efficiently absorb NO2. The technology is characterised by a particularly low drop in pressure. As a result, it can efficiently clean the air while using a low amount of energy. The Filter Cubes not only include combifilters, but also fans which draw in the ambient air. The filters can bind more than 80% of the NO2 and the fine dust contained in the ambient air that is drawn in. As it is a modular system, several Filter Cubes can be installed on top of each other to form a filter column. One column with three Filter Cubes can clean 14,500m³ of air every hour. Control electronics allow the user to adapt filter operation to react to the current air quality. Integrated sensors record air and weather data which are transferred to the Cloud and analysed.